The Nashville-based trio Lady Antebellum did not drag out the time and fascinated both music critics and listeners with the very first long player. After the 2008 release of their self-titled debut, this young band trod the only right trail and quite soon presented their following album. This happened early in 2010; and their new record can be reasonably seen as one of the most important events in the country music to take place this winter. Need You Now has all chances to send a number of its tracks straight to airplays of big stations and earn a multiplatinum status. Released several months before, the single Need You Now did a great job advertising the new full-length record by the American ensemble. Having topped the Billboard country-chart, this song made it clear that the members of Lady Antebellum, Charles Kelley, Hillary Scott and Dave Haywood were preparing a gorgeous present to their supporters. 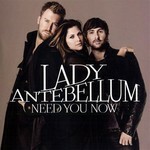 There is no doubt that Lady Antebellum learned a great lesson from their debut work. For instance, they realized that what they are best at are mid-tempo and slow compositions with the hardly tangible rock-music influence. That is why Lady Antebellum executed their new album with an accent on the softer sound, which made the ballad material the most cherished diamonds on the whole record. The above-mentioned Need You Now comes from a category of those songs which creep into your mind and stay there already after the first listening. Its smashing chorus is its strongest part; and there seems to be nobody who could do perform it better than Hillary Scott did. The second single, American Honey, carries the spirit of the long-gone days and captures with the fiddle highlighted against the other acoustic lines. Of those tracks played with full guitar energy, one is likely to love Perfect Day. If this is the first song by Lady Antebellum that you have heard, you would certainly believe the guys are far from the shores of country and search the vast ocean of hard-rock. Since there are two lead-singers on the band, it is hard to overcome the temptation to compare their performance. Ready to Love Again, and If I Knew Then are the best compositions for you to watch the duel between Hillary Scott and Charles Kelly. The music here is intentionally pushed backward to let the vocalists grab all the limelight. Finally, you can not just pass by Hello World. It is not just another country ballad from Lady Antebellum, but an astonishing emotional piece with equally flawless music and lyrics. The professional approach that is demonstrated by Need You Now makes you but respect and admire its makers. The band that makes its first steps into the professional music world seems to grow steadily just every day and every minute. Apparently, the ensemble united those people who can be satisfied with only maximum results. Therefore, you can hardly find any weak point in this work. Perfectly recorded instrumental and vocal lines, polished sound are only, as they say, a good package. Yet it stores a product of the same top quality level. The participants of the American band showcased wonders of creative progress as all of them artfully took part in the writing process. When it comes to materializing what they had in their minds, you start to believe that they are highly skilled veterans of their craft. Already now, these musicians have a unique understanding of making the right things for the right purposes. This band’s success is just a proof to the concept that it is not only pop-music that can make you a mega star. With Lady Antebellum having only two albums of their own so far, their home state Tennessee and its capital Nashville are destined to turn into the center of the contemporary country. And this is just the beginning of the story.